Almighty ever-living God, let us feel your compassion more readily during these days when, by your gift, we have known it more fully, so that those you have freed from the darkness of error may cling more firmly to the teachings of your truth. Through our Lord Jesus Christ, your Son, who lives and reigns with you in the unity of the Holy Spirit, one God, for ever and ever. Historically today is the feast of St. Leo IX, a cousin of the emperor Conrad the Salie, born in Alsace, and baptized Bruno. 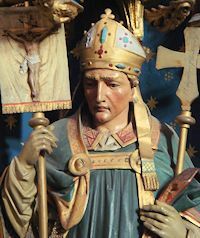 He was made bishop of Toul in 1026 and constrained to accept the papal office in 1048. He took his spiritual adviser, Hildebrand, the future Gregory VII, to Rome and began the reform of the Roman curia. Leo combated simony, condemned Berengarius, and strove to prevent the schism between the Eastern and the Western churches then being engineered by the emperor Michael Coerularius. While at Benevento, a city belonging to the Holy See, he was taken prisoner by the Normans. He was released, but shortly after died before the high altar in St. Peter's. It is also the historical feast of St. Alphege, also known as Elphege. Archbishop of Canterbury in 1006, he was imprisoned when the city fell for exhorting the pillaging Danes to desist from their murdering and looting. He refused to pay a ransom for his release and was put to death. Before becoming Pope, St. Leo IX was known as Bruno. He was bitten by a poisonous reptile when a boy, but St. Benedict appeared to Bruno and cured him. In 1026, Bruno, then a deacon, commanded troops in Italy under the Emperor. The Bishop of Toul died during this time, and upon Bruno's return, he was made Bishop of Toul, where he remained for twenty years. 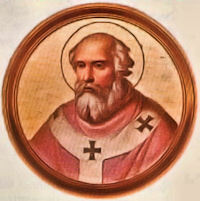 After the death of Pope Damasus II in 1048, Bruno was elected to succeed him. As Pope, he denounced simony and began many needed reforms, traveling extensively to ensure their enforcement. For this reason he was given the title Peregrinus Apostolicus, Apostolic Pilgrim. St. Leo condemned the doctrines of Berengarius, who denied Transubstantiation. He increased the papal territory, though he was criticized by St. Peter Damian when he went to battle to defend it. He opposed the Patriarch of Constantinople, Michael Cerularius; this began the complete separation of Rome from the Eastern Church. Within 40 days of St. Leo's death, there were 70 cures through his intercession. St. Alphege was born in the year 954, of a noble Saxon family. He first became a monk in the monastery of Deerhurst, near Tewkesbury, England, and afterwards lived as a hermit near Bath, where he founded a community under the rule of St. Benedict, and became its first abbot. At thirty years of age he was chosen Bishop of Winchester, and twenty-two years later he became Archbishop of Canterbury. In 1011, when the Danes landed in Kent and took the city of Canterbury, putting all to fire and sword, St. Alphege was captured and carried off in the expectation of a large ransom. He was unwilling that his ruined church and people should be put to such expense, and was kept in a loathsome prison at Greenwich for seven months. While so confined some friends came and urged him to lay a tax upon his tenants to raise the sum demanded for his ransom. "What reward can I hope for," said he, "if I spend upon myself what belongs to the poor? Better give up to the poor what is ours, than take from them the little which is their own." As he still refused to give ransom, the enraged Danes fell upon him in a fury, beat him with the blunt sides of their weapons, and bruised him with stones until one, whom the Saint had baptized shortly before, put an end to his sufferings by the blow of an axe. He died on Easter Saturday, April 19, 1012, his last words being a prayer for his murderers. His body was first buried in St. Paul's, London, but was afterwards translated to Canterbury by King Canute. A church dedicated to St. Alphege still stands upon the place of his martyrdom at Greenwich.